MainOpEdsWhat do Syrian children learn in school? What do Syrian children learn in school? If their textbooks are any indication, the countries accepting Syrian refugee families are in for a shock. • Because of the non-mingling with the nations and the societies where they lived. • Because of their control and monopoly over currency exchange, banks and commercial financing. A child growing up and progressing through the Syrian education system will be educated in a manner that teaches hate and intolerance rather than one that promotes peace. Regarding the Arab-Israeli war , children are taught that it is not a matter of borders but rather Israel’s existence as a whole that is the core of the conflict. Furthermore, they are taught that this conflict is the number one priority issue for Arabs and that fighting it is a matter of honor. This narrative is repeated throughout all age levels beginning in grade 2. Syrian children are also taught that Jews are evil and a false people and that their religion does not make them a nation. Syrian textbooks praise the Holocaust as a positive event. Distorting the fact that Jews call themselves the “chosen people,” the Syrian education system teaches children that Jews themselves are racist. Syrian children are taught that Zionism is the most hostile movement threatening Arab nationalism and the Arab homeland in its entirety. Syrians will inevitably grow up to believe that Zionism is a racist movement based on lies, similar to Nazism, and a partner of imperialism. In addition, the curriculum also teaches that Zionism’s goals do not stop at the borders of Israel but rather threaten all of the Arab lands including Syria. Syrian textbooks describe Israel as an alien entity in the heart of the Arab homeland. Israel is not included on maps in Syrian textbooks, rather the land is labeled as Palestine. Children are taught that the Jews stole the land away from the Arabs and have established an illegitimate, racist, and cancerous nation that is a threat to the whole Arab world. The textbooks blame Israel for Arab backwardness and accuse it of wishing to destroy all Arabs. Syrians learning from this curriculum will grow up hating Israel, Israelis, and Jews and will see no means of achieving peace other than removing Israel’s presence in the Middle East. Since 1948 Syria has been in a state of war with Israel and its educational system has consisted of incitement, hate and delegitimization. Children are taught that Palestine was established by Arabs 4,500 years ago and has been inhabited by them ever since. The Arab land was “occupied” by Israel. They are told that "Jerusalem is considered among the most ancient cities of the world. It used to be called Jebus, after its inhabitants, the Jebusites, who built it in the year 2500 BC. They are taught that the Palestinians are descendants of the Canaanites, for they emigrated from Yemen with the second Arab wave towards the land of Syria." Israel was never inhabited by Jews, nor is Jerusalem holy to them. Their holy sites are not mentioned. The textbooks state that "It is the pure city that God has blessed... Christ lived there... and Muhammad went thither [in his Midnight Journey - Isra' - according to Muslim belief] and thence he ascended to Heaven [Mi'raj - according to Muslim belief]... Al-Aqsa Mosque is there, as well as the Dome of the Rock... and the Holy Sepulcher. In addition, there is a total rejection of peace with Israel. In Syrian education, peace with Israel means surrender and treason. This is how they explain the 1979 peace treaty between Egypt and Israel as well as the abortive agreement between Israel and Lebanon in 1983. The students learn that they “won” that battle with Israel. "We should believe that any hand extended for peace with the aggressors is a criminal hand that must be cut off, because that is an open treason against Islam and the Muslims. On this basis we judge the position of the conspiring agent, who violated his nation's will and his religion's instructions, [Egypt's late President] Anwar Sadat, as well as what he did, beginning in the disgraceful and treacherous visit to Israel and ending in his despicable and shameful negotiations." The “Peace Process” is the continuation of the armed struggle against Israel. The battle for peace is presented vaguely and is unspecified. Nothing is said about Israel’s right to exist within pre-1967 armistice lines. "The Syrian Arab country has rejected all the yielding surrender attempts which aim at the loss of the Arab nation's rights and especially the right of the Palestinian Arab people to liberation and return… We should be alert and watchful of the enemy's deception and cunning and reject any call for peace with it. Lastly, there is a motif of conditional and one-sided peace. Syria will not give up any of its principles for peace with Israel. Instead there is liberation of Palestine as a Syrian goal. This will be achieved by force alone and destroying Israel is a matter of time. Militarism is defined as a secular contribution to the Jihad. The war against Israel is a Jihad. "Jihad has been, and will remain, the only way to defend the homeland and to recover what the enemies have usurped thereof” . In addition to teaching hate and intolerance the Syrian education system teaches martyrdom as an exalted value. Textbooks teach that martyrdom is the way of truth, justice, and glory. Martyrs’ deaths are considered social wedding parties, and are celebrated joyously. This system teaches that martyrdom is the road to victory and liberation. The result of this is that a large number of their youth are bent on dying so that their nation will “live”. Martyrdom is included in other aspects of Syrian education such as poetry and language. They are even given assignments that require students to write about the glorification of martyrdom. The violence incited by martyrdom is apparent, but still is never referred to as terror. Martyrdom and violent acts towards “enemies” are considered heroic military missions. The term terror is reserved solely for Israeli actions. Syrian textbooks support Palestinian terrorism on multiple occasions, referring to Fedai action as heroic and respectful. Terror is supported on the premise that it is the best way to recover the land of Israel and get rid of all its (Jewish) inhabitants. Syrian schools systems teach a monolithic view of the West and of Israel:. Children are taught that Zionism is actually “world Imperialism” headed by the United States. This idea is furthered by claims that the United States and Israel have shared interest against the Arabs. They claim that Zionism is supported by the United States as Imperialism, and that there is an agenda to weaken the Arab nation. These textbooks state that Zionism is the European answer to colonizing the world. They emphasize the western support of the State of Israel and that it is all due to the fact that “Imperialist States” wanted a State for themselves. Education in Syria is state controlled and must conform to the ideology of the ruling nationalist socialist party. Dr. Arnon Groiss is an Arabic-language journalist who has just retired from the Voice of Israel Arabic Radio after 43 years. Dr. Groiss taught for several years at the Hebrew University in the 1990s and 2000s. Between the years 2000-2010 Dr. Groiss served as chief researcher and, later, as Director of Research at the Institute for Monitoring Peace and Cultural Tolerance in School Education (IMPACT-SE, formerly known as the Center for Monitoring the Impact of Peace – CMIP), a non-political NGO committed to studying the attitude to the “other” and to peace in the Israeli and in other Middle Eastern curricula. During his work there, Dr. Groiss studied hundreds of textbooks of various school subjects and authored over ten reports on Palestinian, Egyptian, Syrian, Saudi Arabian, Iranian and Tunisian schoolbooks. A summary of his ten-year research of this subject is to be found in “De-legitimization of Israel in Palestinian Authority Schoolbooks”, published in Israel Affairs, Vol. 18 (2012), Issue 3, pp. 455-484, where he compares the PA schoolbooks with other Arab and Middle Eastern ones, including their Israeli counterparts. Dr. Groiss has presented his findings since 2000 to both policy makers and people of the press on numerous occasions in various places, including the US Congress, the European Parliament, the UK House of Commons, the Israeli Knesset, the Canadian Parliament, the French Assemblée nationale and elsewhere. 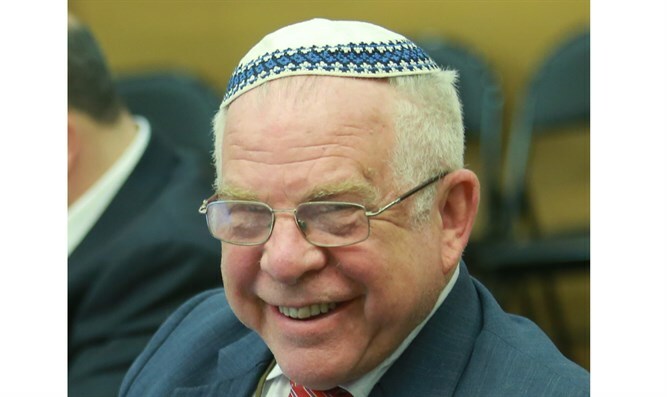 On the basis of his experience in this field, Dr. Groiss was appointed as a member of the Scientific Advisory Panel (SAP) of the Palestinian-Israeli Schoolbook Research Project commissioned by the Council of Religious Institutions of the Holy Land (CRIHL). The project was funded by the US State Department and ended in February 2013. Dr. Groiss’ evaluation paper of this research project is to be found here. Dr. Groiss is currently retained by the Nahum Bedein Center For Near East Policy Research.